Attention Facebook users ! If you are seeing a Facebook post promising outrageous videos, for instance"Shocking video: World's Largest Snake Video, Don't click it, It is nothing other than Survey Scam. There are various facebook posts circulating with different bogus title in facebook that leads to a survey scam page. 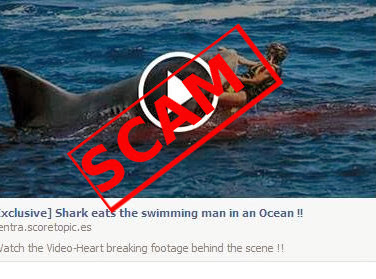 So far, the topics used in the scam campaign are " SHOCKING VIDEO World’s Largest Snake Found In [Brazil /Mexico ]", "Exclusive: Shark eats the swimming man in an Ocean!! Watch the video". The user who clicks the link in the post will be taken to a web page where they are asked to complete the survey in order to view the video and share the video in their facebook account. At the end, you will get nothing other than being a victim of the scam. Remember, there is no such videos. If you come across these kind of posts, just ignore it /report it to Facebook.